Offering up service fit for a king the Hansel Service Cart will make spending time outdoors exponentially more convenient and enjoyable with all the amenities it offers. Featuring a natural slate top with copper inlays this cart easily trumps the competition in style. A handy pull-out basket is large enough to store 750ml wine bottles and the included, detachable bamboo cutting board means that having wine and cheese in your backyard has never been easier! A built-in secondary shelf offers more convenient storage and the rolling design means that even a fully loaded cart can easily move to where its needed most. Built out of durable steel this little service cart is not only extremely convenient and beautiful but rugged too! Transform your cramped outdoor living space into an enjoyable hideaway with this Patio Bistro Table. Rust-resistant glass tabletop will withstand years of outdoor use. Weather- and UV-resistant multistep powder-coated finish in brown. Folds for easy storage and portability. Purchase as a stand-alone piece or in unison with matching folding chairs (sold separately). Sturdy, durable steel frames form the foundation for a long-lasting and stylish accent table. Decorative, weather-resistant high-performance powder-coating covers all of the frames surfaces, creating a beautiful and appealing framework for the table. The accent table features a beautiful stamped pattern which provides a brilliant visual appeal. Enjoy your outdoor space with the Hampton Bay Park Meadows patio furniture made with beautifully hand-woven wicker and durable steel furniture frames. The faux wood table has a slat-top surface. Perfect for your porch, patio or sunroom. Coordinate this table with other pieces in the Park Meadows Collection. The Hampton Bay Commercial Grade Sterling Slatted Top 18-inch Square Occasional Table in Brown features an all-weather rust-resistant Aluminum Frame. The table is easy to clean and weather resistant. You can coordinate this Occasional table with the Sterling Collection Dining Chairs or Chaise Lounges for a complete set. You can add other Sterling collection pieces to complete your patio area. Hansel Patio Service Cart Offering up service fit for a king the Hansel Service Cart will make spending time outdoors exponentially more convenient and enjoyable with all the amenities it offers. Featuring a natural slate top with copper inlays this cart easily trumps the competition in style. A handy pull-out basket is large enough to store 750ml wine bottles and the included, detachable bamboo cutting board means that having wine and cheese in your backyard has never been easier! A built-in secondary shelf offers more convenient storage and the rolling design means that even a fully loaded cart can easily move to where its needed most. 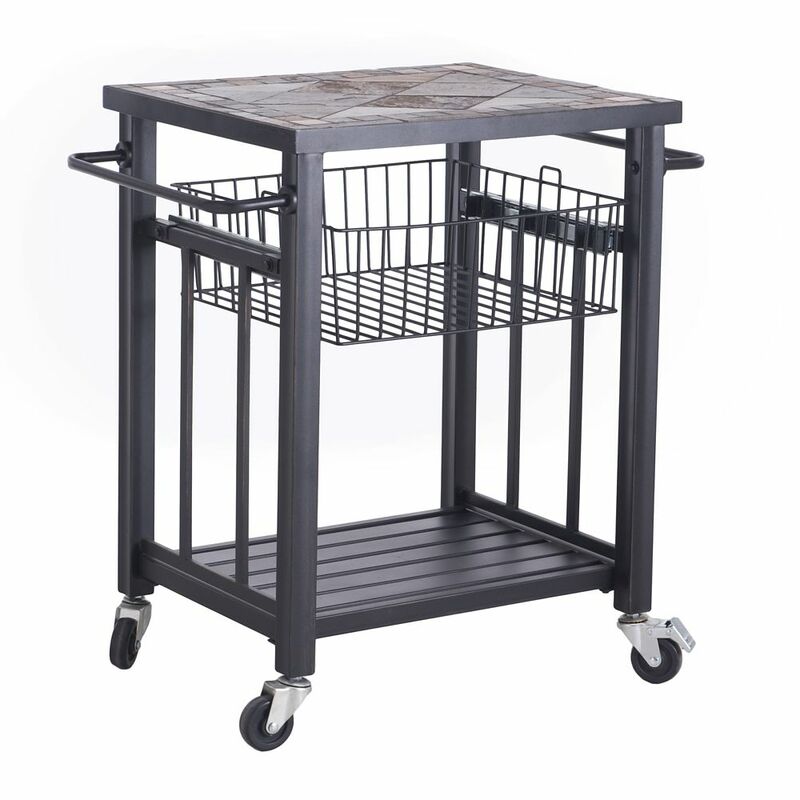 Built out of durable steel this little service cart is not only extremely convenient and beautiful but rugged too! Hansel Patio Service Cart is rated 4.7 out of 5 by 3. Rated 5 out of 5 by Jack from Works great,looks great and performs great. Easy to assemble tho there was one bolt missing from... Works great,looks great and performs great. Easy to assemble tho there was one bolt missing from the package. I called the 800# and the missing bolt was sent right away. Rated 5 out of 5 by PrincessChicken from Perfect! I love this cart. It was easy to assemble, sturdy, durable, and does exactly what i need it to. It's good it has the locking wheels so it doesn't roll around and the cutting board is a nice extra. I'd definitely recommend this one. I looked around and a lot of the serving carts were a lot more expensive and didn't have but 2 shelves...this one has a lot more to offer, and the decorated top is very nice too. Rated 4 out of 5 by Carol from Disappointment We assembled the cart but when finished, the drawer did not slide easily. As a matter of fact, it is quite difficult, rendering the drawer unusable. I saw this cart assembled in 2 different BJ's and the drawer in both cases were also the same way. You would think I would have taken that into consideration, but no, I thought it was coincidental and perhaps not assembled properly by staff. Well guess what. My drawer doesn't work either. I love the cart otherwise but unfortunately I think this May be a design flaw. I have written the company and am waiting to hear what they have to say..